A neighbor of mine is interested in installing a vertical garden, or living wall, to cover a concrete wall in his back yard. As he and I have been doing research and talking about this project, I've become inspired to do a little experimenting of my own. 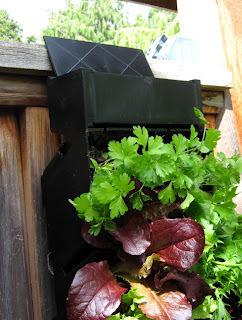 I bought one of Bright Green's GroVert living wall planters (Amazon affiliate link) to see see how their system works. This 10-cell, polymer panel measures 8" wide, 18" tall and 4" deep. 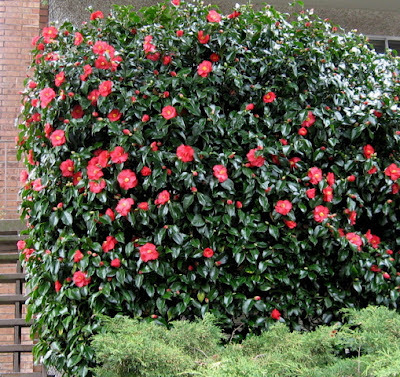 Multiple panels can be linked together to create a solid living wall. The cells of the planter are set at a 45 degree angle to keep water and soil from falling out once the panel is mounted on the wall. Very clever! 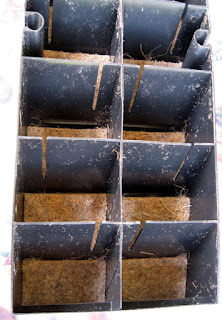 At the base of each cell is a "moisture mat" - another smart idea - that holds water and keeps plant roots from drying out. Here's the fun part - planting! I decided to fill my panel with salad greens and a few herbs. But there are lots of other possibilities, including succulents, foliage plants and annuals for sun or shade, depending on where you plan to install your vertical garden. 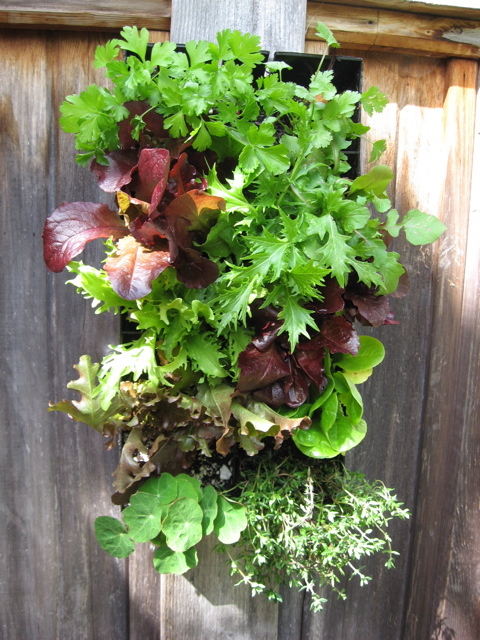 For my "living salad wall" I wanted lots of color and texture, plus I wanted organic starts since I plan to make salad eventually with what I've planted. So I headed to West Seattle Nursery to see what I could find. I came away with lettuces: 'Wildfire Mix,' 'Salad Bowl Red,' 'Winter Density,' a spicy mesculun mix, and endive. I also got 4" starts of cilantro, Italian parsley, French thyme and and 'Apricot Trifle' nasturtium. I realized as I planted these that it might have been better to have planted less in each cell, and filled in with more potting soil. It is tempting, though, to do just what I did, because a 4" pony-pack fits really nicely into each cell. But no worries, I can easily revise the planting if necessary as the season progresses. OK, with the planting done, the next step was to water thoroughly and let the panel sit at a slight angle to drain before mounting. 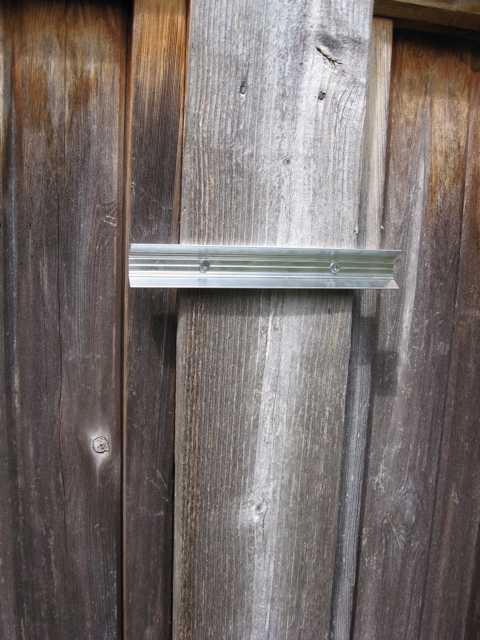 While the panel was draining, I installed the bracket to hold the panel onto my fence. You'll have to furnish your own fasteners. 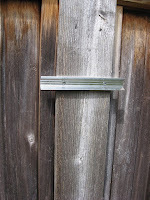 Fortunately, I had some galvanized wood screws on hand. And here it is - my living salad wall! To top it off, I added an irrigator box. This little box mounts on top of the panel and holds a quart of water. 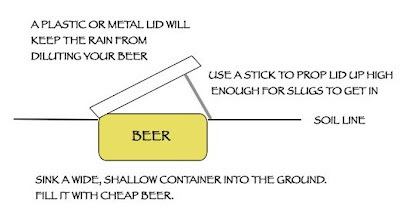 (I'm showing it here with the lid open. After adding water, you'll want to close the lid to keep dirt from getting in.) Small holes in the bottom of the box let water slowly trickle down into the planter, keeping the plants and the moisture pads irrigated. It will be fun to see how this works out. As with any gardening experiment, I expect some plants to do well and others will need to be replaced. If I get a few salads out of it, I'll consider it a success. Regardless, the planter and irrigator will still be around for me to use in another season. I've never been a fan of spirea. When I hear the name, what comes to mind is one of the big, sprawling bridal veil varieties (Spirea cantoniensis, S. prunifolia, or S. x vanhouttei). These plants produce masses of white flowers in spring that, to me, smell unpleasantly musty. I don't want to be around them. 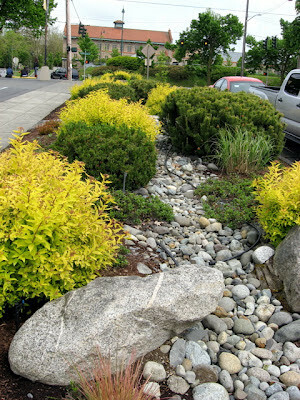 But there is a mound form of spirea (Spirea japonica) that has won me over. There are several plants in this group, many of which stay below 3' tall, all with striking foliage. Cultivars such as 'Goldflame,' 'Goldmound,' and 'Limemound,' certainly live up to their names in the garden. I've been admiring some of these on my regular trips to the local PCC store, where they are planted in the dry stream bed garden out front. Here you see examples of what I assume are either 'Goldmound' or 'Goldflame' in the PCC garden. This is Spirea japonica 'Magic Carpet,' a Pacific Northwest Great Plant Pick. It will hold this yellow/chartreuse color all season and will have pink flowers in summer. 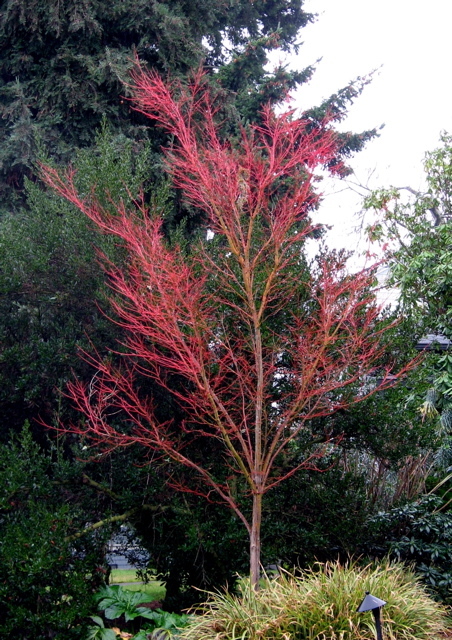 This vivid foliage, edged with bits of bronze, red and coral, appears to be lit from within. Mature size will be about 2' x 2'. I've planted it next to 'Red Fred' heather. We'll see how they get along. If you've ever tried to grow basil here, you know that it isn't fond of our cool, maritime Northwest climate. Plants set out in May often sulk, refuse to grow - and then die. I used to work at a local nursery and watch customers come in week after week to buy basil plants to replace the ones they lost the week before. We recommended cloches and bringing plants in at night until temperatures warmed, but that advice fell on deaf ears. Visions of pesto, bruschetta, and caprese salads got in the way, and plants went into the ground much too early. All that said, it is possible to grow basil successfully in Seattle. If you get seedlings started indoors in mid- to late April, they will be ready for transplanting in early June when the soil has finally warmed up. It is easy to do this. All you need is a sunny windowsill, some potting soil, a container for the soil - an empty egg carton will work just fine - and some seed. The fun part is the seed! You generally always have more varieties to choose from in seeds, for any type of plant, than you will find when you buy seedlings already started. Growers can afford to grow what they believe they can sell, and they aren't too willing to try exotic varieties. You, however, have options. Take a look at this list of basil varieties from Botanical Interests (a Seattle Garden Ideas affiliate). You can choose from lemon basil, lime basil, purple basil, Thai basil, Italian basil, Greek basil, plus organic and heirloom blends. Imagine the possibilities! It will take about 4-6 weeks for your seedlings to be ready to plant outside. You will need to harden the seedlings off - meaning that you gradually acclimate them to being outside. One way to do this is to cover them with a floating row cover, like reemay fabric, after you plant them. The fabric will keep the plants from being sunburned during the day and hold heat in overnight. After a few days, you can remove the fabric and the plants should be hardy enough to thrive. So there you have it - everything you need to know about getting basil to grow in Seattle. Enjoy! One of the great benefits of having a blogging business is the opportunity to partner with remarkable companies that I would never have known about otherwise. 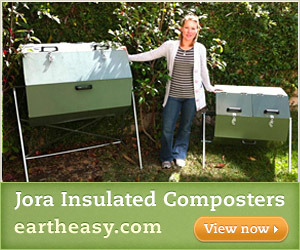 Eartheasy, the newest affiliate sponsor for Seattle Garden Ideas, is one of those companies. Eartheasy is a family-owned business dedicated to helping people improve their quality of life by offering information and products for sustainable living. The company founders, Greg and Lindsay Seaman, have 30 years of experience living sustainably and share that first-hand knowledge with their customers online. You can read the story of how their company evolved here. On their website, you will find products for your home, water conservation, non-toxic pest control and energy efficiency. Of course, the category I am most excited about is their Yard and Garden section. They have a good selection of composters, raised bed systems, natural weed control products, watering gear, potting supplies and more. In their Guides section, there are dozens of articles on sustainable living, gardening, eating, playing, clothing and more. • They plant a tree for every order placed via their partnership with the Trees for the Future Foundation. • Eartheasy is carbon neutral. • Eartheasy is an EPA WaterSense Partner. • Eartheasy is a member of Green America, a non-profit dedicated to creating a socially just and environmentally sustainable society. • Eartheasy is a member of Sierra Club Green Home, which aims to help Americans make their homes more energy efficient, healthy and environmentally sustainable. I hope you'll take a few minutes to visit the Eartheasy website. Thank you. I'm happy to introduce to you a new affiliate sponsor, Botanical Interests. Curtis Jones, who started the company with his wife Judy Seaborn in 1995, describes their business this way, "I like to say that we're a gardening education company that just happens to sell seeds. 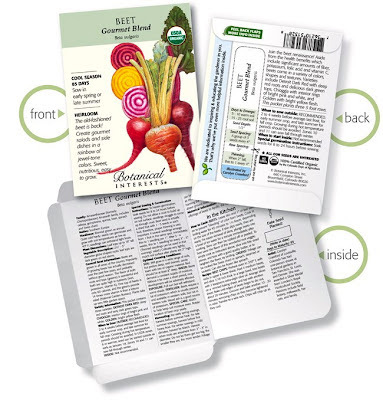 Our packets are like mini-encyclopedias, full of information to inspire and assist every type of gardener." 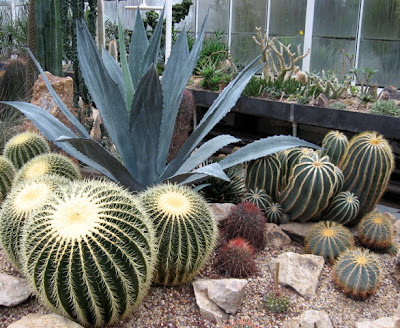 The illustration below (from the Botanical Interests website) shows you what Curtis is talking about. Each packet features a beautiful botanical illustration of the flower, herb, or vegetable. It includes a description of the plant and detailed instructions for starting the seed. There is a plant tag on the back. And that's just the beginning! 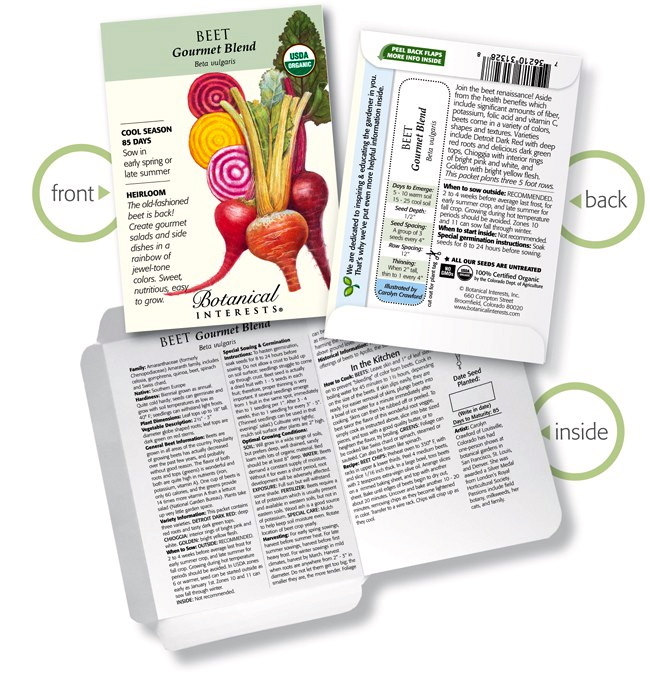 Inside the packet is more information: plant history, tips on growing and harvesting, how to avoid pests and diseases, recipes and more. The seed inside these packets is something special, too. Botanical Interests carries over 500 varieties of high quality seeds, including many varieties of heirloom seeds and 150 varieties of organic seeds. NO GMOs. None of their seed is treated. The germination rate is checked before packaging to assure quality. Curtis and Judy are committed to preserving the tradition of passing along gardening knowledge from generation to generation. "We're helping people reconnect with some of that lost art," Judy says. When you visit their website, you will find articles and their blogs devoted to helping people get the most out of their gardening experience and create traditions of their own. Which includes cooking! Their blog, Seed to Saucepan, offers creative ideas for preparing the wonderful things you grow in your garden. I hope you'll click the banner at the top of this post and take a few minutes to visit the Botanical Interests website. 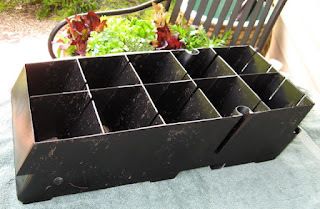 Whether you are new to starting plants from seed or an old hand, I believe you will find something of interest and value there. 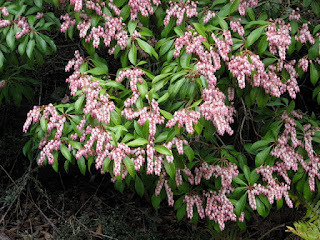 Lily of the Valley Shrubs (Pieris japonica) are about half way through their spring bloom and color show right now. These graceful, slow growing shrubs are popular in the Seattle area, and for good reasons. First, there are the flowers. Large clusters of bell-shaped flowers appear in early March. Perhaps most commonly seen in Seattle are plants with white flowers. Flower color choices also include shades of pink, such as 'Valley Rose' and 'Valley Valentine.' 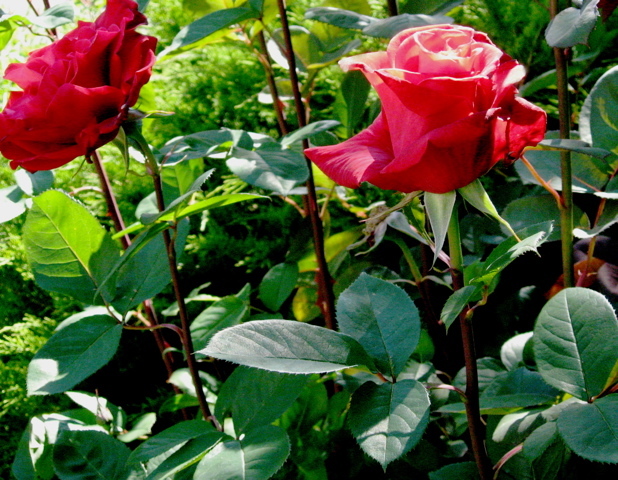 Some like 'Christmas Cheer' and 'Daisen' have white flowers edged with rose red. But the show's not over when the flowers fade. New foliage emerges in colors ranging from bronzy pink to fiery red. Those colors last for 2-3 weeks and then the leaves turn green as they mature. There are many varieties of Pieris japonica. Some are dwarf plants, such as 'Pygmaea,' which gets to about 18" tall and wide. Some have variegated leaves, such as 'Variegata,' which has a white margin along the edges. All are slow growing and attractive year around. Lily of the valley shrubs are easy to care for in the Western Washington area. 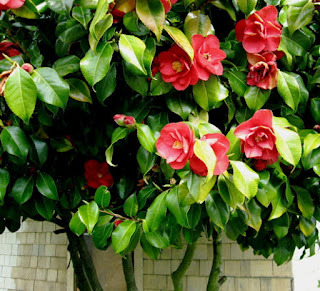 These plants like part-shade, and moist, acidic soil. Older plants can be limbed up to look like small trees. 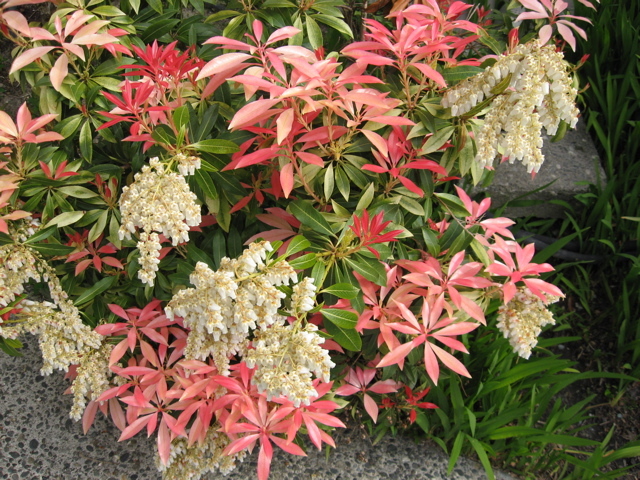 Pieris is often grouped with rhododendrons and azaleas, which have similar soil and sun requirements. 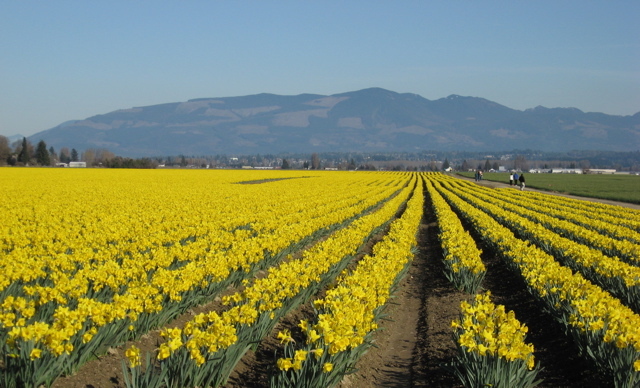 Skagit Valley is home to the largest commercial flower bulb growing operations in the US. These companies host the annual Tulip Festival, which runs the entire month of April. Hundreds of acres of colorful bloom make this a popular event for both gardeners and photographers. of tulip blooms to come at the Skagit Valley Tulip Festival. The exact bloom time of the tulip fields depends on the weather. This year's long winter and cool temperatures mean that the blooms will open a bit later this month than they have in other years. But don't let that slow you down. Start planning your trip now by visiting the Festival website. There you will find a map of the gardens, information about the growers, things to do and places to see. Plan on making a day of it and be sure to bring a camera. This is a wonderful outing for the whole family. For a preview of what you'll see, including stunning photos of unusual tulip varieties, watch this video created by Travelingrandma. Gorgeous! OK, "euphoric" might be an exaggeration - I don't necessarily feel euphoric when I see one of these. I just thought it would make a catchy headline. 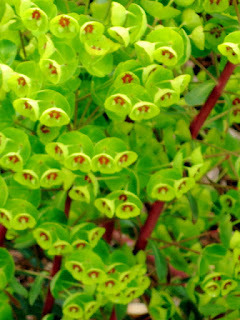 Still, Euphorbia in its many forms is a striking plant. Getting double-takes on the streets of Seattle right now are these specimens of E. wulfenii, that stand about 4 feet tall with huge, chartreuse "flowers." These flowers, technically, are collections of brightly colored bracts. If you look closely you will see tiny "true" flowers nestled inside each bract cup. There are about 2,000 species of Euphorbia. Probably the best known variety is the poinsettia (E. pulcherrima). Euphorbias can take many forms: shrubs, perennials, annuals and succulents. Most require hotter, drier conditions than we have in the Northwest, but there are several that do well here. In addition to E. wulfenii, look for Mrs. Robb's bonnet (E. amygdaloides robbiae), donkey tail spurge (E. myrsinites), E. palustris, and more at your local nursery. Note that all plants in this family have white, milky sap that will irritate and even burn your skin. Be sure to wear rubber gloves and long-sleeved shirts when handling them. I've had some nasty burns working with these plants, even when I thought I was being careful. This sap is poisonous if ingested - the level of toxicity varies depending on the cultivar. There is a variety of Euphorbia called a mole plant or gopher plant ( E. lathyris) because it is believed that the poisonous sap will kill burrowing rodents who attempt to feed on its roots. I've never known this to work. Moles eat worms and grubs, not plant material. 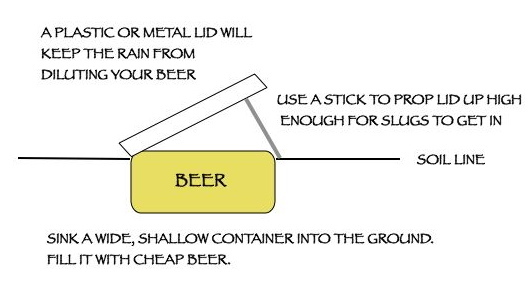 For more on what doesn't work, here's an article from MoleCatchers. To get rid of moles, you have to set traps. 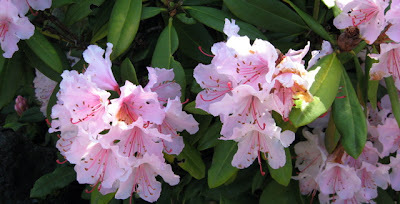 As I explained in my introduction to the plant list for shady garden beds, you want to design your garden so that it has a framework, or structure, that is visible year around. 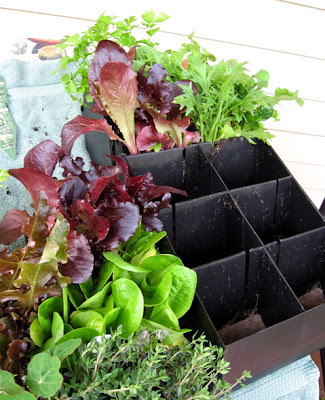 When you do this, your garden will look good all year, even in the dead of winter. Here are some plant choices for sunny exposures. Comments: Deciduous; deep red leaves; mound-shaped; very tiny yellow flowers in spring; very thorny, can be used as a barrier plant; rarely needs pruning. Comments: Boxwood grows in sun or shade; it can be clipped into a hedge or allowed to grow naturally as a dense, round shrub. Comments: Many cultivars to choose from in different sizes; all are very tolerant of bad soil, drought and salt spray; flower colors range from white to pink to purple; evergreen; use as a hedge or in small groupings. Comments: Very dark, green leaves; formal looking; needs no clipping; forms an attractive low hedge. Comments: Many cultivars to choose from. Leaves vary a great deal in size, color, and texture, from convex blue-grey to fleshy purple. Showy varieties like 'Amy' and 'Tricolor' aren't likely to survive prolonged cold or heavy frosts (believe me, I've lost several). But most all varieties will tolerate seaside conditions. 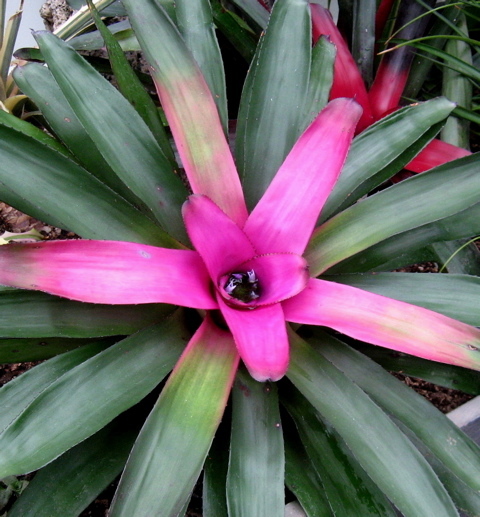 Short flower spikes in summer are purple or white. 'Red Edge' lives up to its name in winter/early spring with attractive red margins on the leaves. Comments: Blue foliage with star-like form; unlike any other juniper; good blue accent in the garden. Comments: Not really a bamboo, but called that because of its leaf shape. All varieties are evergreen. Many to choose from. All do well in sun or shade, but color up best in sun. 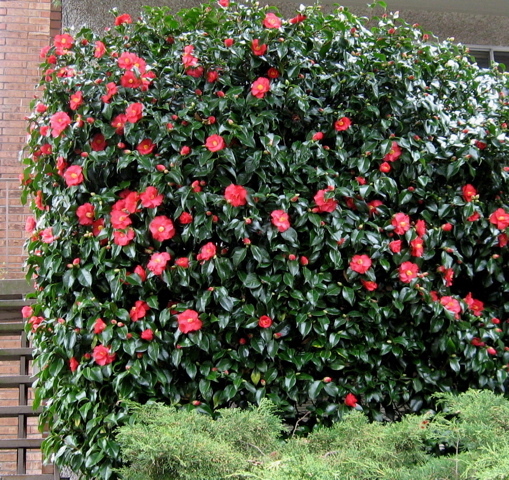 'Compacta' is fast growing up to 6', column shaped, red new growth, clusters of white flowers followed by red berries. 'Gulf Stream' gets approximately 4' x 3', burgundy new growth in spring which ages to dark rich green by summer. 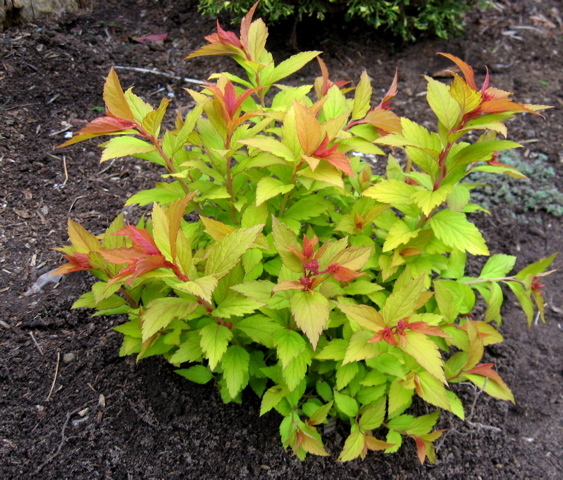 'Moon Bay' is slightly smaller, about 3' x 3', new foliage is bright red and/or yellow, like all Nandina, color changes with temperature making it interesting year around. There are many more varieties available. Some have lots of berries, some have none; shapes include: tall and slender and short and wide; some a ground covers. 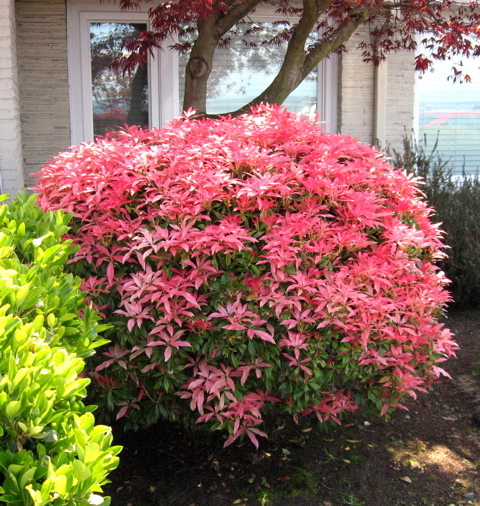 There is some form of Nandina for just about any place in a garden. Comments: This is a dwarf version of a large mound-shaped pine. Provides year around texture and visual interest. Comments: Often used as a low-growing border. 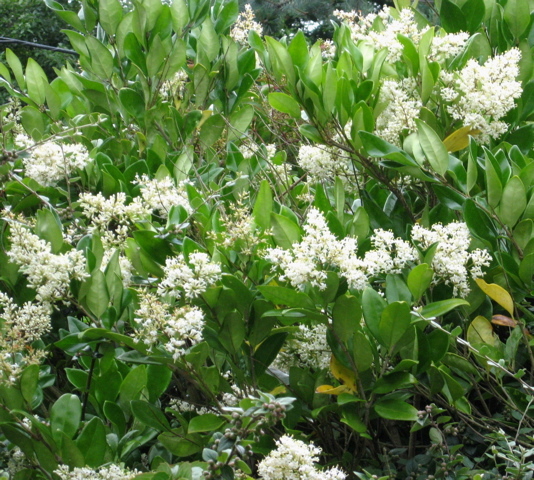 Has clusters of white flowers in spring, followed by iridescent blue berries. Need more ideas? 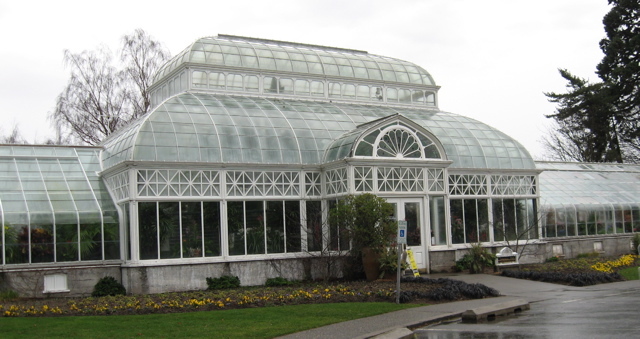 Get your copy of The Pacific Northwest Gardener's Book of Lists. Comments: There are many plants in this group: E. wulfenii is stunning in late winter, standing 4 -5' tall with large clusters of chartreuse bracts atop its many stems. Look for smaller varieties, too; new ones are introduced often. Be careful working with these plants. Their white, milky sap will burn your skin. Wear long sleeves and gloves. Comments: All three of these are fragrant; all are drought tolerant; all have blue or purple flowers; all are evergreen, although the sage will lose some leaves in winter. Lavender makes a good low hedge with several varieties to choose from, including Spanish lavender which features a little topknot on top of each flower. Upright rosemary plants will quickly become small shrubs. 'Tuscan Blue' has a particularly vivid blue flower in late winter, early spring. There are several varieties of sage to choose from: purple sage makes a nice accent; pineapple sage has yellow-green leaves. Comments: There are many grasses to choose from. Grasses in the Carex family are small, mound-shaped and come in several colors ranging from medium green leaves with creamy edges to bronze. The Miscanthus family includes many interesting cultivars from 4' to 8' tall, with different leaf colors and striping, all topped with feathery plumes in summer. 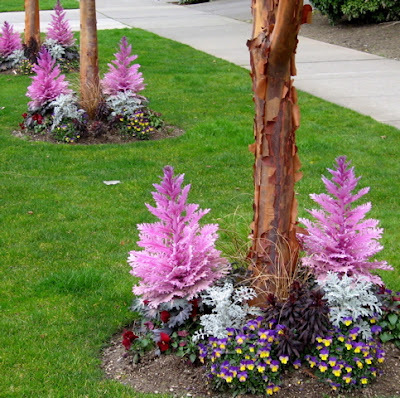 Ornamental grasses can be beautiful and easy to maintain if you choose the right ones. They can be invasive and lots of work if you don't. So do some research before you plant. Consult The New Sunset Western Garden Book for detailed information. Comments: This is the upright form of a prolific group of plants; several attractive cultivars include 'Autumn Joy' and 'Brilliant.' 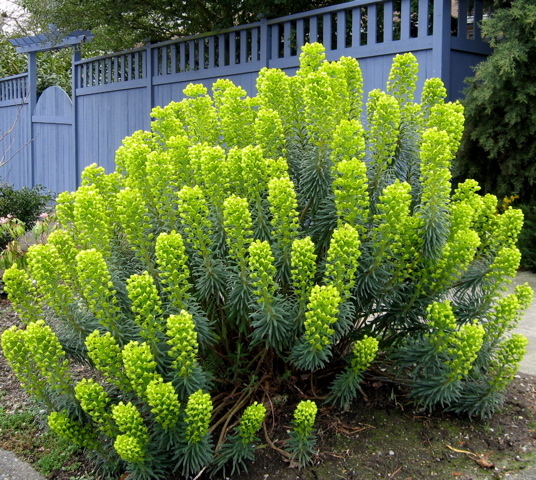 New foliage begins to show above ground in winter, followed by flowers that resemble broccoli heads. These turn pink or reddish as spring progresses and become handsome dried flowers by fall. 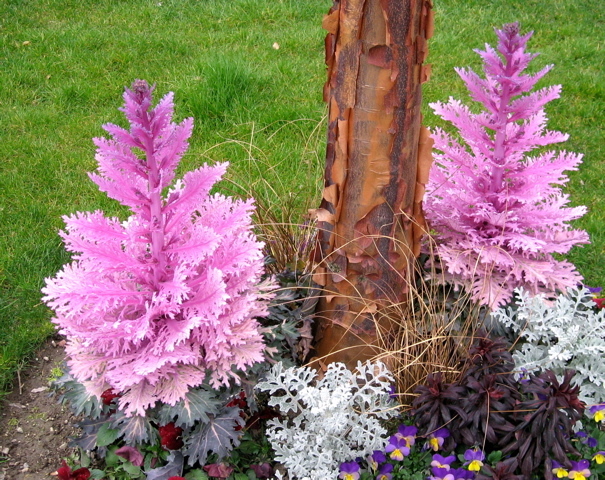 Newer introductions have purple foliage. In honor of the first day of spring, here's a video featuring the magnificent Yoshino cherry trees at the Seattle campus of the University of Washington. Enjoy! "30 Yoshino cherry trees are the hallmark of the University of Washington Quad. They were first planted on land that is now the approach to SR 520, but were relocated to campus during construction of the bridge. Estimated to live between 60 and 100 years, the trees are approximately 63-73 years old. In anticipation of replacing them, the UW Class of 1959 launched the Cherry Tree Project. Cuttings were grafted onto rootstock, and replacement trees are growing in a nursery in Mount Vernon, WA. Visit the original cherry blossoms in the Quad as they begin to bloom now through April. And keep learning. It's the Washington Way. http://www.keeplearning.uw.edu"
If you plan your garden beds so that they look good even in the winter months, you can be sure they will look good all year around. The way you do this is to include plants that are either evergreen or have something interesting to offer in the winter. 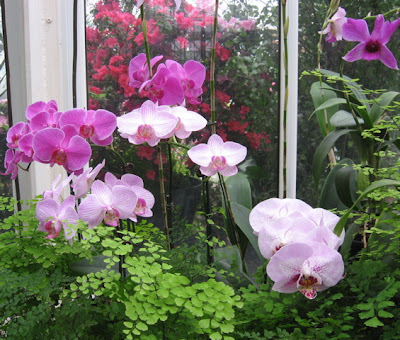 Then arrange those plants like a sort of framework, what some people call "the bones of the garden," around which everything else - bulbs, annuals, herbaceous perennials - comes and goes throughout the year. Here are some choices for your shady area. 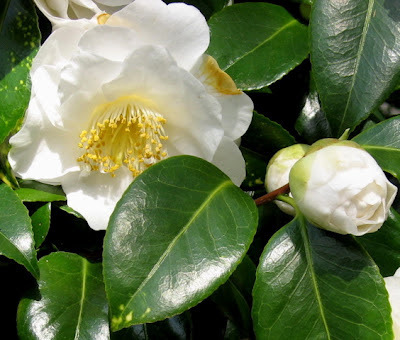 Comments: C. japonica is the larger of the two, with glossy green leaves and white or pink flowers. 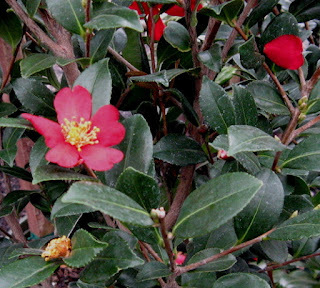 It blooms in late winter into spring and can be trained into a small tree. C. sasanqua is smaller and finer textured. It blooms around Christmas and has a wider variety of flower colors. Good for espallier. Comments: Deciduous shrubs. C. glabrescens, called fragrant winter hazel, grows 8' - 15' tall and has yellow clusters of fragrant flowers in winter. C. paucifolia, buttercup winter hazel, is much smaller, 4' - 6', with yellow flowers. Both bloom before leafing out. Comments: Fussy daphnes are grown for their divine scent and handsome foliage. This one is no exception. Its fragrance will fill the garden in late winter and the variegated foliage will brighten the landscape year around. Evergreen. Comments: This daphne is semi-evergreen. It emits a wonderful scent from tiny white flowers in late spring and summer; leaves are edged in white. Comments: Tropical looking shrub, often sold as a house plant, with large, deeply cut leaves. Roundish clusters of white flowers are followed by black fruit. Bold accent plant. Comments: Many cultivars to choose from; purchase plants in bloom to be sure of flower color, which ranges from white to deep rose; plants are evergreen, with large clusters of bell-shaped flowers in spring. Comments: Huge selection to choose from! Look for unusual leaves or flower color to add interest; consider planting specimens of different varieties to stagger bloom time from very early February to late May/June. Comments: S. hookeriana humilis gets only about 18" tall; S. ruscifolia reaches 4' 6' tall and 3' - 7' wide; both have tiny, white, intensely fragrant blooms in winter. They account for much of the wonderful fragrance you enjoy at the Witt Winter Garden in Seattle in late January and February. Comments: Evergreen. There's a male and female form - the female produces red berries. Tiny, white, lightly fragrant flowers bloom in spring; slow growing, mound shaped plant. All skimmia get mites sooner or later. They won't kill the plant and there's nothing really effective you can do to get rid of them. 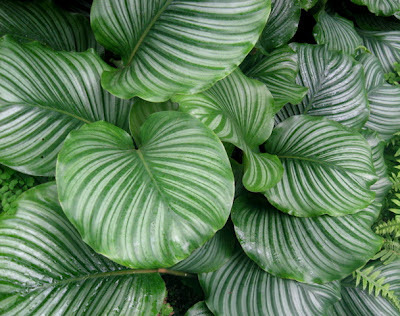 They create an interesting "stippled" effect on the leaves, which is so common that most people think it is normal. Comments: Several varieties to choose from: Christmas rose, Lenten rose, Corsican hellebore, stinking hellebore, etc. All have cup-shaped flowers, ranging from white, to chartreuse, to pink and deep, nearly black purples; leaves vary in shape and color from light to very dark green. Comments: Woody, shade-loving ground cover. 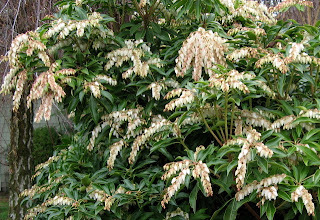 Small white flowers in short spikes in late winter, early spring. Attractive all year. Variegated form is also available. Sometimes there is a large, empty area in a garden that needs something substantial to fill it up. For one reason or another, a tree would be out of place. Perennials and ground covers would be too small to provide the required visual oomph. What is needed is one really big shrub to fill the space and bring some interesting form, flower or fragrance into the garden. Here are some possible choices. 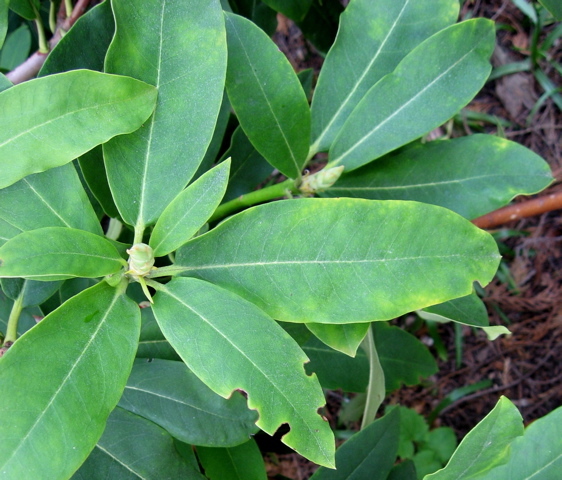 Comments: 'Edward Goucher' is a smaller variety, about 5' tall; evergreen; profuse lilac blooms late summer through early fall; arching habit. Do not shear this plant, allow it plenty of room to spread. For more information on these shrubs and much, much more, get a copy of The New Sunset Western Garden Book. This is the latest edition of this classic garden guide, released in February, 2012. Long before there were big pharmaceutical companies and drug store chains, medicines came from plants found in nature or cultivated in home gardens for that purpose. Those medicinal plants are all still here, if you know where to look. The list below includes just a few of the plants that have been used traditionally for medicine. How many are you familiar with? Perhaps this post will give you a new way to see and appreciate plants, including the weeds, you find around you. Note: The source for this post is "Natural Healing for Women" by Susan Curtis and Romy Fraser, 1991. A new edition of this book is available at Amazon. I am not offering this information as medical advice. See a naturopath or homeopath if you are interested in herbal treatments. This herb is used primarily for stomach disorders, such as colitis and nervous stomach. Hops help the gut assimilate food and the body put on weight. They also have anti-bacterial properties and are used to treat pustular skin diseases, weeping eczema, acne and impetigo. The fragrance of jasmine oil has an effect on the emotions and is most effective when there is a clear link between psychological stress and physical discomfort. It is considered to be a classic aphrodisiac, used to treat both frigidity and impotency. It can help relieve depression and menstrual cramps. Passionflower is a calming herb, useful to take when there is a build up of energy and thought that leads to insomnia. It has anti-spasmodic properties and is used to treat epilepsy, Parkinson's disease and neuralgia. Kinnickinnick is a urinary antiseptic, used to treat chronic urinary tract infections. It also helps dissolve and pass kidney stones. It should not be used during pregnancy. This is a warming herb used to treat cold and weak conditions. It is good for painful periods. It has astringent and anti-inflammatory properties. It is used to treat mouth ulcers and as a gargle to relieve laryngitis. This herb contains an alkaloid called vincamine which has the effect of increasing oxygen to the brain. It is used when overwork causes giddiness, poor memory, headaches and vertigo. It is an astringent and aids in clotting blood. It is used for gut problems such as colitis and can be used to prevent nosebleeds. St. John's wort is used when the body needs revitalizing; it is good for overspent people or those low in energy. It is an effective anti-depressant and can help poor memory. This herb stimulates cell respiration, soothes the pain of exposed or pinched nerves and aids healing. This herb is good for the congested liver when there is constipation and irritability. It calms the nervous system, especially in cases of poor digestion and insomnia. As a dried herb, woodruff can be used by itself or with lavender as an insect repellant. Thyme has many medicinal uses. In the respiratory system, it has an antispasmodic effect on the lungs, as well as being an expectorant. It is useful in the treatment of respiratory conditions such as asthma, bronchitis, TB or emphysema. It can be taken for indigestion, and inflammation or infection in the digestive tract. It helps relieve diarrhea. Thyme is also anti-fungal, anti-bacterial and anti-viral. Lamium has astringent and anti-spasmodic properties. It is good for balancing the female reproductive system and is beneficial for tired and debilitated women. This is a cooling and moistening herb that can be used internally or externally. It is particularly good for the lungs, skin and joints. It is slightly diuretic which makes it cleansing of the whole system, thus good for treating rheumatism where joints are hot and tender. Chickweed calms the heart and can be given for palpitations. There are enzymes in the whole plant that activate kidney and liver secretions and functioning. Dandelion stimulates the general metabolism, aids cell respiration and is particularly good as a spring tonic. It is good for treating diabetes, because it helps the pancreas work more efficiently, and for rheumatoid arthritis, gout and kidney disorders. 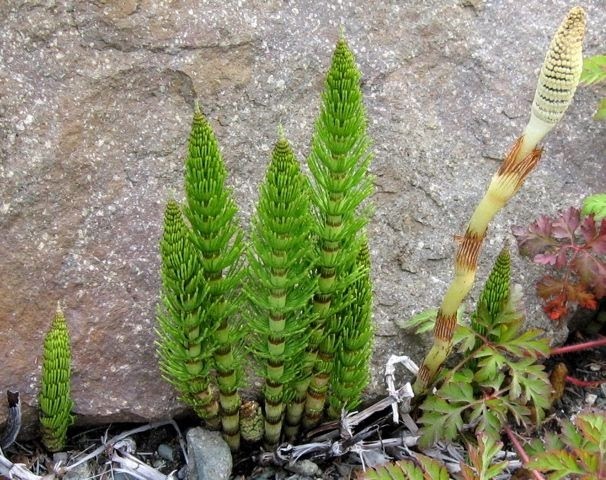 Horsetail has wide ranging actions. It contains saponins which make it diuretic. It strengthens the tone of the bladder and helps with difficult menstrual periods. It also contains silica which makes it good for the connective tissues of the body. It is used to strengthen weak joints and treat arthritis. An infusion of horsetail can be used as a hair-rinse for split ends. It can also be taken internally for weak and brittle nails. In case you missed my earlier post listing 10 Good Deciduous Trees for Small Urban Gardens, you can access it here. Now here are 10 MORE good choices. Comments: Great small tree/shrub for year around interest; yellow to orange spidery flowers appear before leaves in winter, some varieties are fragrant; attractive leaf and branching patterns; great fall color ranging from yellow to red-orange. Comments: Pyramidal form; slow growing; orange-red to purplse fall color; creamy white flowers in summer resemble those of cmellias; showy, peeling bark with shades of tan, green, grey, rust, terra cotta and cream. Comments: Oval-round shape; white flowers same as above, but more fragrant; blooms somewhat later in the season; yellow fall color.